The HIV virus weakens the immune system and allows opportunistic diseases to set in. Garlic works to bolster the immune system and kill a whole range of bacteria, viruses and fungi. In addition to a prescribed medical and/or nutrient program, garlic is recommended by many alternative practitioners as a protective food to keep infections at bay. Researchers have found garlic to be effective against the various common infections in AIDS, including, herpes and cryptococcus, as well as cryptosporidia, pneumocystis, mycobacteria and cytomegalovirus. Indeed, garlic may actually obstruct the spread of HIV virus in the AIDS patient!! What is so far understood is that garlic sets in motion three cell types in the immune system’s arsenal that are important in combating HIV and AIDS-related infections. A garlic compound, diallyl trisulfide, activates the natural killer cells, the Cytotoxic T-cells, (which attach themselves to microbes and secrete poisons into them), the phagocytes, (which swallow invader germs), and the lymphocytes, (which make antibodies that kill specific microbes). Breakthrough, promising research into garlic’s therapeutic value for fighting HIV was first presented at the 1989 International AIDS Conference and subsequently published in the German Journal of Oncology (Deutsche Zeitschrift Onkologie). 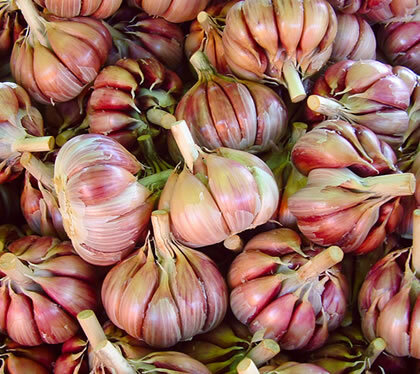 Kyolic garlic (aged garlic preparation) was given to ten AIDS patients. All had blood indicators of advanced stage AIDS, with various opportunistic infections, including genital herpes and cryptosporidial diarrhea. For the first six weeks the patients received 5 grams, or around 2 cloves of garlic daily and then 10 grams or 6 cloves daily for another six weeks. Three of the patients were unable to complete the trials because they were at the terminal stages of the disease and died before the trial ended. However, the seven who completed the trials showed NORMAL killer cell activity by the end of the twelve week period (six of them regained normal killer cell activity by the end of the first six weeks!). Also highly significant was the fact that all the patients’ infections improved: including a candida infection, genital herpes and chronic diarrhea. One patient with chronic sinus infection, who did not get any relief after a year’s worth of taking regular antibiotics, improved after the garlic trial. To date, not all of the exact mechanisms of garlic’s action, or its medicinal constituents are known . However, the interaction of three main compounds of garlic, aliin, allinase, and allicin, (when garlic is crushed), result in the creation of sulfur compounds, including diallyl trisulfide, which are key to garlic’s effectiveness as a medicinal agent. Allinase, an enzyme, acts upon aliin to form allicin, which is the compound that gives garlic its pungent odor and sharp taste. The further breakdown of alliciin, also results in up to 400 other compounds, (garlic keeps giving!! ), thirty of which have known medicinal value. Scientists know that many of garlic’s therapeutic compounds have yet to be identified. Garlic is more and more frequently being used as an adjunct treatment for HIV and AIDS patients. Author, Paul Bergen, in The Healing Power of Garlic, quotes Dr. Jane Guiltinan, clinical medical director at the Healing Aids Research Project at Seattle’s Bastyr University: “I most often prescribe garlic in food form rather than capsules or extracts. I have them (AIDS patients) eat as much as possible, either raw or cooked.” In Alternative Cures, by Bill Gottlieb, eating three medium cloves a day, or 9 grams of raw garlic in juiced form is recommended to HIV-positive patients. It can be taken in doses of 3 grams three times a day, morning, noon and evening. Garlic juice is a very active form and can be added to other freshly made juices. The Immune Enhancement Project in Portland, Oregon, as well as San Francisco, use Chinese and naturopathic methods to prevent and treat (among other diseases and conditions) HIV and AIDS-related infections, which include the use of GARLIC. They also offer a wide range of programs and services, including consultations, therapeutic shiatsu massages, acupuncture, Chinese herbal treatments and nutritional supplements all at low cost (last known fee as low as $100 per month), with financial aid available, depending on the situation of the client. thanks for bringing this life saving news into light. Thanks for this infor. Wish had seen this well b4 lives were lost due to ignorance of garlic’s miraclous saving power! I want to help fight HIV & MRSA infections globally. Ensure that more publications are availed even in local languges to us Africans. Surely it will do more in fighting scourge. I just bumped on it coz many of our Asian seem to like it and was just curious. Thanks for the fantastic information. I have proven miracle of garlic after I start taking two cloves a day, I feel heathier and happier than before. i have a testimony I read online about the wonderful miracles of garlic. I said to myself let me try consuming raw garlic cut in tablet form, mixed with little olive oil and swallowed with warm milk, to protect my stomach lining. I normally suffered from terrible hayfever. After taking garlic for about 6 months my symptons have improved I am more healthier, no longer getting tired. Garlic has done wonders for me, try it and you will not look bCK.